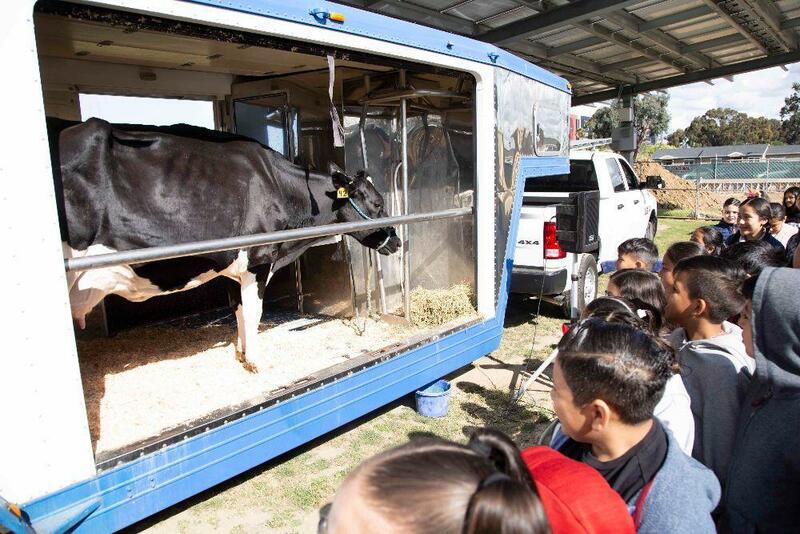 Lennox, Calif., April 5, 2019 - Felton Elementary School students beamed with excitement when they saw a cow and calf revealed during a visit Friday morning from the Dairy Council of California’s Mobile Dairy Classroom. Mobile Dairy Classroom, an assembly program under Dairy Council of California, travels to schools throughout the state to educate students on cow anatomy, dairy farming, agriculture and nutrition. The assembly complements Dairy Council of California’s free, in-classroom nutrition curriculum, which aligns with Common Core standards. When Mobile Dairy Classroom is paired with the classroom lessons designed to build healthy eating behaviors from all food groups, students can make a powerful food literacy connection with a lasting healthy impact. Felton Elementary students had an opportunity to meet Louis Batista, a local dairy farmer and Mobile Dairy Classroom instructor, and a cow and calf from a local farm. Batista began the assembly by asking students about food groups and their daily eating habits. He talked about the importance of food literacy and helped students make the connection between dairy and other foods they generally consume. Batista asked students questions about farms and cows, leading up to the big reveal. Lifting the side panel of the trailer to show the dairy cow and calf, students jumped out of their seats in excitement to get a better view of the cow. Batista moved on to teach them about the anatomy of a dairy cow and related it to a person’s body parts. He also mentioned that cows use their tails to swat flies while people use their hand. Students laughed. Students eagerly raised their hands and participated in the assembly, moving around in their chairs to get better views. They learned firsthand the journey milk and dairy foods undergo to get from the farm to the table, even seeing a live demonstration of how to milk a cow. By the end of the assembly, students gained invaluable first-hand knowledgeable of how milk and dairy foods are produced, how they contribute to healthy eating, the role agriculture plays in the food supply, and the anatomy of a cow.